I love bananas. I probably eat more of them fresh than I do apples over a year, and, apparently, so do most Americans. Statistics say we eat about 26lbs. of bananas a year per capitata here, none of which are grown in the US (Small amounts are grown in Hawaii and some local areas in the far south of the US, but those are consumed locally, not distributed elsewhere.) If we think of the plants and the growing of them at all, many of us tend to assume that most bananas produce edible fruit, but they don’t…at least nothing we’re used to eating! While gardening in the public sphere downtown I had many people ask me, as they looked at the occasional flowering on the Musa basjoo, one of the four bananas that had taken up semi-permanent residence in three of my large display beds, if they fruited and could be eaten…my usual response, yes, but you wouldn’t want to. The temperate world’s experience of bananas is largely limited to the produce section at the grocery store. Most of us would be surprised to learn that sweet bananas, which are typically eaten fresh, and cooking bananas known commonly as plantains, together, comprise the fourth most important food crop around the world, in terms of volume of production, after only Rice, Wheat and Corn…ahead of soybeans which go into tofu, soy sauce, which are consumed by much of the world and as a common component of livestock feed. That’s an amazing statistic! The banana is cultivated as food in 100 tropical and sub-tropical countries. In some parts of the world the fiber from the pseudostems is harvested and used locally for making twine and sometimes a coarse cloth. In Okinawa friends have told me that Musa basjoo was once a common source of fiber for a cloth. Other bananas are utilized in other ways, the corm of the African, Ensete ventricosum has traditionally been ‘processed’ by indigenous people as a ‘survival food’ for periods of drought when other sources have failed. Bananas are a major source of carbohydrate for much of the world’s people accounting for up to 25% of an individuals diet in parts of rural Africa. Plantains, the starchy cooking banana, predominate amongst indigenous people in many regions. In Africa, the vast majority of bananas grown for local consumption are the starchy, plantains. In other areas the fresh eaten sweet bananas dominate production. Bananas are local food. India and China, the two largest producers by volume, all of the way down to those countries whose production is spread amongst countless small landholders, all consume the vast majority of their bananas locally. In these places bananas are an absolutely essential component of the local diet. The export market is limited with several barriers in the way of local growers. Of course scale is a major one, small producers complicate things logistically and most of them grow primarily for their own consumption. China, the second largest producer also imports from the Philippines to meet its own consumption needs. In tropical regions the climate can support fruit production nearly year round with variable pauses during the dry season. In some areas irrigation has enabled nearly year round production. Worldwide, 85% of the fruit produced are consumed locally only 15% going into the export market to provide populations in temperate countries with the uniform fruits, the industry has figured out how to get to us in a timely controlled way. Successfully shipping bananas long distances is not just a matter of boxing and loading them on a ship. There is a very specific protocol involving climate control and ethylene gas to control and initiate ripening. The Cavendish cultivars comprise an estimated 47% of the world’s production of edible bananas, 50 billion tons, the hundred’s of other cultivars producing the rest. The Cavendish bananas make up almost all of those that are exported and a majority of bananas grown in many countries including the largest producer in China. Most cultivars aren’t amenable to the treatment and handling they must go through to reach our markets even if they weren’t needed at home. Some have thinner skins and are much more subject to bruising. Other cultivars don’t ripen evenly which is more of a problem for the export market than it is for local consumption. This map shows the range of the two species from which spring all edible cultivars of banana. The green area is Musa acuminata, the orange, Musa balbisana. 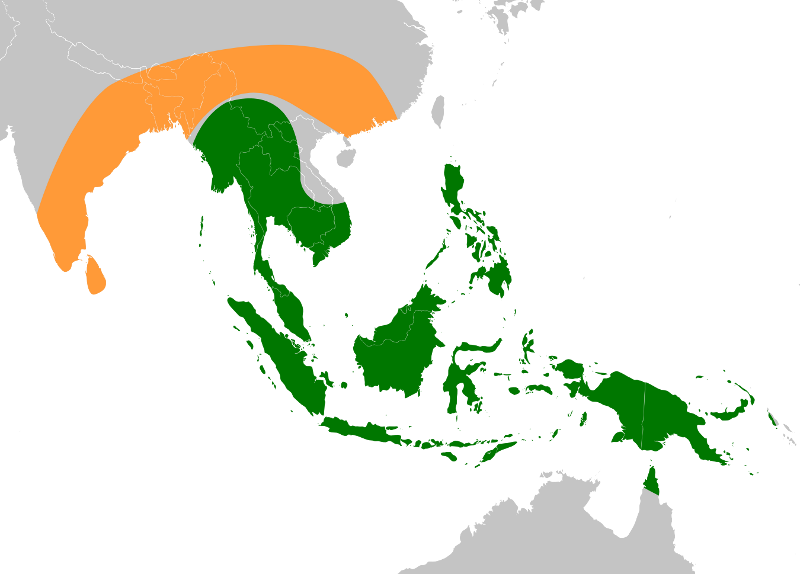 The disease TR4 as well as the earlier form, TR1, both originated in the Malay portion of the region marked in green. Cultivars today are farmed throughout the tropics, into the milder sub-tropical regions of the world, wherever there is the water to support them, far beyond the areas demarcated on this map. Edible bananas are highly selected and cultivated over the last several thousand years. There is evidence of their active culture in Vietnam’s Mekong Delta area 10,000 years ago. Even before our active growth of them, bananas were forming natural hybrids. Due to confusion estimates vary between 300 and 1,000 modern banana cultivars today. The same cultivar can be known by different names from region to region. It is difficult to examine and compare them all because that requires that samples be dried and preserved as herbaria, pressed and mounted on sheets, for study which is not possible due to their size, structure and perishability. Genetic analysis has determined that all of these cultivars are derived from the two Musa species M. acuminata and M. balbisiana, each cultivar possessing a different mix of the two or just M. acuminata. The wild species produce ‘edible’ fruit as well, but that’s like saying Daucus carota, the common Queen Anne’s Lace, produces an edible root like the domesticated sweet carrots, descendent from it, we’re all accustomed to. The fruit of the Cavendish banana, which accounts for over 90% of those we find in the grocery store, has a unique set of chromosomes that sets it apart from all others. It is a triploid with three sets of chromosomes, all from Musa acuminata, in the nucleus of its cells. The Cavendish can no longer successfully divide and recombine its chromosomes in the process of sexual reproduction and they have lost the ability to produce viable seed without the aid of extreme measures in a lab. Cultivated bananas are all triploids or polyploids, having three or more sets of chromosomes, they are mutations, often of plants that have been crossed and back crossed, in the wild by chance and by generations of farmers seeking the best qualities, superior plants selected, then reproduced asexually, by division, or cloning, over a period of hundreds, maybe thousands of years. These cultivated sterile plants, with superior fruits, have become dependent on the farmer for their existence, and the farmer has been largely dependent upon these bananas for their own survival, assuring the continuation of each. Their relationship is not unlike that of other wild species that have formed very dependent relationships in terms of pollination and seed spread for the plants and both a food source as well as often a site for reproduction and early growth of other species. Cultivated bananas contain multiple sets of chromosomes with seedless fruits, possessing the ‘eating’ qualities their growers were looking for. Some cultivars don’t even produce pollen anymore. They are ‘stable’ clones, in a sense ‘fixed’ in time. The Cavendish banana is only one of these and they have been chosen for the worldwide export market because of their ripening and shipping qualities, their ability to withstand storm damage, the shorter stature of the plants, which makes harvest easier, their ability to resist bruising that can result from handling, as well as their high production volume and their eating qualities. This limiting of genetics has rendered them susceptible to disease, their abilities to adapt, being limited and fixed as well. As should be expected, this has become a problem. The two wild species, fortunately, still exist in the wild where they continue to reproduce sharing and conserving the genetic diversity of their species, Musa balbisana in India and Musa acuminata, across much of SE Asia from the Sunda Peninsula across much of the archipelago. M. acuminata produces small sweet pickle sized fruit with a few hard, peppercorn sized, seeds. Musa balbisana is a larger, more robust plant, that produces more and larger fruits each containing many seeds. Farmers have by necessity been keen observers, a skill no doubt adopted as habit from their hunter/gatherer predecessors noting the plants that have had more desirable attributes, choosing them to grow on. When a new, better form appeared in their plots and fields, they adopt that one. In the case of bananas, they learned a great many generations ago that to keep it ‘true’ they had to divide it in order to increase its numbers. Eventually, through the compounding of chromosomes and mutation, their plants became sterile and dependent upon them. Desirable plants were traded or perhaps stolen from others and eventually came to dominate production. Good and bad for us humans…good because it became a valued and desirable source of food and nutrition, but bad, because over time, land that had previously served as sites for the wild species were no longer available to them and natural hybrids that remained fertile and capable of evolving with the changing world of threats that always confront organisms. Sterile clones are unable to adapt or evolve to a world that is still changing around them including the diseases and insect pests that might plague them. There is considerable genetic work as well as more traditional breeding efforts being done with bananas today to create resistant hybrids and cultivars, because this susceptibility to the disease TR4 has become critical for the ‘industry’. 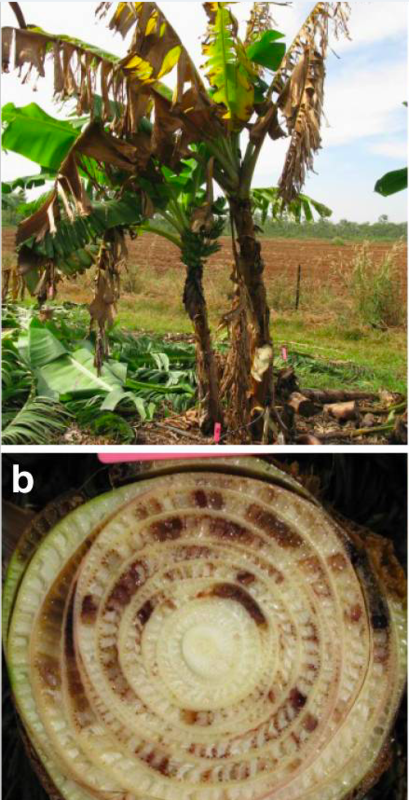 The fixed and limited genetics of the Cavendish banana and the culture of bananas on such a global scale, has made them vulnerable to evolving diseases, specifically, Panama Disease, a form of fungal Fusarium Wilt, Tropical Race 4 (TR4). There are other diseases as well, but this one is the biggest threat. A different race of this disease (TR1) threatened the industry in the 1950’s, forcing it to quit growing the cultivar Gros Michel, which was the most widely grown banana for export at the time, reputedly still the ‘tastiest’ in the pockets where it still survives, and adopt the Cavendish types as the export industry standard. The Canvendish is resistant to TR1. Now it makes up almost the entirety of those exported. Cavendish bananas are failing in infected fields and people are scrambling to develop and test new varieties. There are no obvious resistant candidates to replace it. With 47% of the world’s ‘sweet’ banana production now limited to the Cavendish types, the impact can be catastrophic in terms of much of the world’s diet. The pathogen can easily be carried from farm to farm on tools, vehicles and the soil itself…even on the boots and clothing of workers and visitors. Quarantines are our only option for containment and a necessity for at least slowing the spread of TR4. Many are fatalistic and believe the disease will eventually invade the major growing areas around the world, including the Americas which have so far escaped infection. Some other varieties are also susceptible…not just the Cavendish types. Those varieties susceptible to earlier strains are also to TR4, as are several others which were resistant to TR1. Resistance alone is not enough in a candidate because the eating quality of the fruit is absolutely essential to the industry’s survival, as well as the qualities previously discussed. All of the other cultivars came up short in the 1950’s which is why the Cavendish has dominated the production and the export market of sweet bananas for more than 60 years. These characteristics are essential to the industry and is why we, the consumers of export bananas, see so few of the cultivars grown around the world for their limited local markets. Other cultivars possess characteristics we don’t expect of a banana…or, they are very difficult to ship any distance at all. Farmers who grow for the export market have very limited options…whether they grow them organically or with the aid of pesticides. TR4 is resistant to fungicide treatments….The industry’s future still remains in some doubt….For subsistence farmers, those growing for their own consumption, the problem is larger and threatens their daily survival. Finding and obtaining a resistant alternative is not as easy as simply ordering one on line. Ecuador, the world’s fourth largest producer of bananas, is the largest exporter supplying about 1/3 of the total volume of the international market. They, the Caribbean and the rest of South America are still free of TR4. The Philippines, Costa Rica, Guatemala and Colombia are other major contributors to the export market. As the disease spreads the export market will feel the result of TR4, the Philippines supplying Japan and China, South American Countries sending most of theirs to North America, Africa and the Caribbean supplying Europe and Russia. Many or most of us who consume these imported bananas will be able to substitute another food item should the growers who supply us have their fields laid to waste by the disease…we won’t be under threat of starvation. This won’t be true for either banana exporting countries or smallholder subsistence growers who depend on them for survival. The export of bananas are significant in that the income they produce helps offset the cost of foods that these countries are importing to feed their own people. In countries with negligible exports the income from banana production is still important. Small land holders earn as much as 70% of their cash income from local sale of their fruit. Whether a country or small landholder, the loss of this income due to diseased plants and decimated production will be devastating above and beyond the loss of income. The loss of such a central food stuff will not be easily replaced by substitutes. Populations won’t have the money to buy food from elsewhere. TR4 was first found during the late 1980’s in Taiwan. In the 1990’s it appeared in Malaysia and Indonesia, the center of diversity for the genus and the species, Musa acuminata. Some suspect that the disease has always been there, but has only become a problem as both acreage has increased and the Cavendish spread across so much of the region ‘incubating’ the disease until now. It quickly made its way to China and the Philippines where it has severely effected production. It has more recently made it to the northern, tropical part of, Australia. It is now reported in most SE Asian countries where bananas are grown. The large multinational farms have been a major vector of the diseases spread as their equipment and workers move between fields. Keep in mind that as a soil borne fungus, once infected, fields must be abandoned. Susceptible cultivars will not be able to survive there even if left fallow for years. Research suggests that the fungus can survive for at least 40 years in the soil without a banana host to grow on. Production must be moved, planting ‘clean’ plants in new uninfected fields. This is an even bigger problem in the the developing world amongst small landholders…they can’t simply move. In 2013 TR4 was discovered on the east coast of Africa in Mozambique…gaining a more local access point for the continent of Africa. Reports of its spread are escalating. The disease, which is such a serious threat to the survival of small landholders is also not widely understood by them. The need for phytosanitary practices may be the only thing standing between them and disaster. With global trade and the movement of the disease via soil, time would seem to be working against them. It’s arrival in Mozambique demonstrates, again, that oceans no longer stand as an unbridgeable barrier to disease, be they of humans or other life forms. Trade and travel have dissolved the barrier of distance. Fortunately for many indigenous peoples, those who grow and consume plantains and many of the freshly eaten, sweet bananas, this disease may pass by as TR4 does not effect them all. It was unclear if any of the plantains were susceptible. Many small subsistence growers may dodge this particular ‘bullet’, but even so the loss of an export crop for many of these countries may still loom large. What the future may hold for larger land owners is unknown. Many will scramble for other crops to substitute, but if they can’t, who will take over the land and what will be its fate? Some of the work being done today is genetic, taking a resistant gene from one banana or organism and substituting it for one that is susceptible in an attempt to add in resistance to Panama Disease, TR4. In some cases they are exchanging one banana gene for another. They argue that, in this case, these are still in every way a banana. Others argue that these new clones are legally ‘genetically modified’ and as such they must be banned from the market in many countries, which is the law….Others argue that because these bananas are sterile, the modifications can’t be transmitted by pollination to other fields or wild populations, so they should be allowed, as they don’t present a threat to banana genetics, which is a major intent of these laws. The other intent is the protection of the consumer’s health, from the possible ‘threat’ posed by unique and ‘unnatural’ molecules and proteins in their food. Geneticists working on this disease are arguing that because they are taking a gene from one banana and putting it in another, that it is still a banana, that the banana that they have produced ‘could’ have been produced naturally over the course of enough time and generations…but the industry doesn’t have this time, and modern cultivars, these susceptible Cavendish cultivars specifically, are unable to pollinate each other…they are genetic ‘dead-ends’….The genetic work of some includes the use of non-banana genes, which includes those from some insects that show resistance. Their work is at a scale that most of us have trouble grasping. There is a history of governments, universities and organizations affiliated with growers, working on improved banana cultivars. Efforts actually began in the 1920’s to produce cultivars that were resistant to Fusarium Wilt which had already arrived in Panama and Central America by then. The effort ended with the economic collapse of ’29 and didn’t restart until the end of WWII. The dominant cultivar of the time, Gros Michel, was mostly sterile and could only rarely be ‘coaxed’ into producing seed, a necessity in traditional breeding programs, greatly slowing its progress. In the end, the attempt was dropped and Cavendish was substituted for Gros Michel by United Fruit which very soon came to dominate the export market. United Fruit (Chiquita Brand) ended their breeding program in 1984 and the Honduran government took it over. 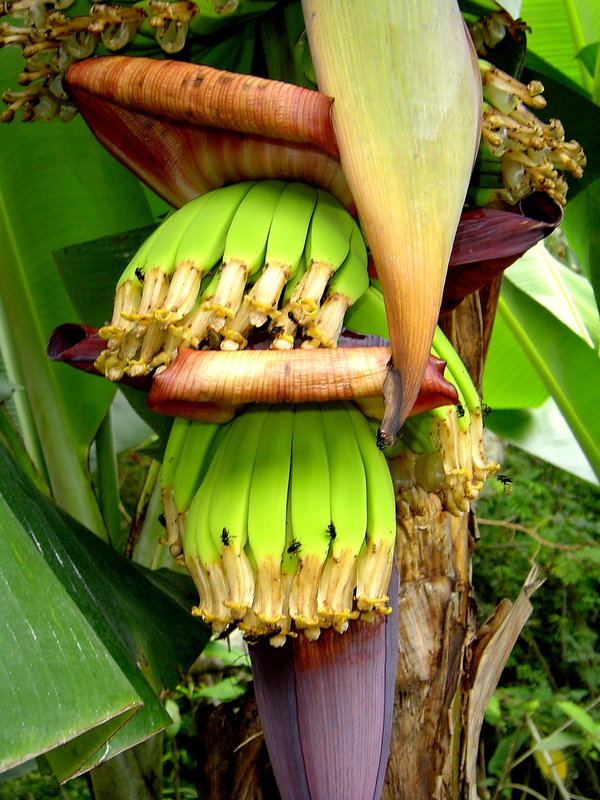 This new organization, known as the Fundación Hondureña de Investigación Agrícola (FHIA) has been committed since then toward creating new resistant banana and plantain hybrids traditionally. Theirs is the first such program to have delivered disease-resistant hybrids to farmers. Several newly modified cultivars have been produced and tested for disease resistance in labs…where they stay…for now. One of the labs, in Australia, because of the stringent licensing agreement they’ve signed, with their government, have never even tasted the fruit from these new plants, as such is expressly forbidden. The otherwise healthy/clean fruit is immediately composted after the plants have been tested for disease. Researchers in The Netherlands have been busy identifying the specific genes resistant to TR4. Their goal is not a GMO banana, but a ‘new’ banana developed through more conventional plant breeding. They have tested some 20,000 individual plants of some 250 types in the process. Researchers in other countries have been testing available new cultivars, sometimes produced in labs through micropropagation in which they have induced changes and then grown on, which have demonstrated some resistance. The search continues for more. Others are testing more traditional organic techniques like intercropping and rotations with other crops. In China, for example they are doing this with Chinese Leeks, Allium tuberosum, which has anti-fungal qualities, with some limited success. In Australia James Dale, has been working to find a gene that will block the ability of the several strains of Fusarium Wilt to signal cell apoptosis and the consequent cell death in susceptible bananas. Every organism, as it ages, will eventually get to the stage where cell apoptosis is initiated, when the cell ceases to maintain itself and begins to degrade and slide into death. TR4 and the other strains of the disease are thought to bring this about prematurely when it infects the cell and organism. Dale and his associates worked to locate other organisms that have the capacity to block this process and have been able to insert these genes into Cavendish bananas. The set up a field study of these and other reputedly resistant forms from other programs that used different strategies to develop resistance. Their work is laid out in the paper linked to below. Dale argued that it is not the physical presence of TR4 itself that leads to the death of these cultivars, it doesn’t produce toxic substances, but its ability to impose apoptosis. There are two ways a cell can die either by necrosis, which is brought about by physical injury, poison, being cut off by blood supply, etc., a process that is quite messy. In apoptosis though, the cell commits ‘suicide’ in a more natural process. It is normal in an aging organism, even as a part of other normal processes within a healthy organism, and is sometimes referred to as programmed cell death. In this case, however, the message to commit suicide comes from outside, from TR4. Their study was positive and supportive of their central hypothesis, but more studies are called for before it can be considered to be implemented. Strict quarantines, which runs counter to trade, will always be a necessary part of the solution, in order to both exclude the disease from uncontaminated sites and to contain and limit its spread from contaminated sites. Some countries, already effected, like Australia, have put very specific protocols and quarantines in place to limit its spread. In Australia these include the virtual seizing of infected properties and the strictly limited control of bananas around the country including a decontamination guide for growers (pdgkdecontaminationguide) that applies to all workers, visitors, equipment and vehicles that are brought on or taken off the site each and every time. This alone would seem to be an overwhelming task. When you consider what this might mean for the small landholder, especially in those countries where education, resources and understanding of the disease and its spread are limited…this seems nigh impossible. Few banana producing countries that have thus far remained free of TR4 have programs in place to either monitor for it or exclude it. This, potentially, is the kind of problem that we should expect to occur more often across all of agriculture, as markets become more global and the genetics become more narrowed. Uniformity of ripening, the ability to efficiently and mechanically harvest, the ability to handle and ship food stuffs with limited loss and damage as well as the consumers who want to be able to consume a fruit or vegetable that meets the expectation of their palate, and eye, no matter the time of year or grower, all of these things work to limit the genetic diversity of our food and the plants that produce it…. This makes our food supply more vulnerable to disease. Up until relatively recently, with the mechanization and consolidation brought on by modern agriculture, farming had been more local and its products more genetically diverse. The ‘seed industry’ has also developed shrinking both the variety of food stuffs produced as well as narrowing the variety and genetics of any one crop grown. Seed for agriculture is largely produced and limited by a handful of corporations. Previously seed was saved and selected by the farmers themselves and diversity was high. Under this old traditional ‘system’ crop failures would occur occasionally, and could be catastrophic locally, but globally we were always okay. Globalism has brought with it its own suite of problems. All of this brings home the absolute necessity of maintaining genetic diversity in the form of healthy wild populations which in all too many cases are under threat. The global trade of foodstuffs is a threat to both our long term food security and the preservation of genetic diversity….As the human population continues to increase, and the production of food becomes more global than local, we put ourselves into a more precarious position, susceptible to such crises. Regional and global trade is necessary for food security to buffer regional populations from drought and other local threats, but a heavier reliance on the global trade of food stuff places us in a position of higher risk, as the example of TR4 and bananas demonstrate, due to both the consequent loss of genetic diversity and the linked losses of locally arable lands as we lose our capacity to feed ourselves locally when the global market comes under threat of disease. “Evolutionary dynamics and biogeography of Musaceae reveal a correlation between the diversification of the banana family and the geological and climatic history of Southeast Asia“; Steven B. Janssens, Filip Vandelook, Edmond De Langhe, Brecht Verstraete, Erik Smets, Ines Vandenhouwe, and Rony Swennen, The New Phytologist, 2016. A well researched and relatively accessible look at where the ‘modern’ banana came from. “Scientists Identify TR4-Resistant Bananas”, Mike Knowles, Fruit Net, August 2018. It should be noted that a replacement for Cavendish is still a long way off utilizing this approach. More specific information on TR4 and both industry and governmental responses can be found on the ProMusa website with links to more. Progress has been made since this was written, but the disease has also spread more widely. James Dale has headed the research through Queensland University of Technology in Brisbane, Australia, into adding TR4 resistant genes into bananas. This is the paper authored by the group discussing their work which was first laid out in the above New Yorker article, “Transgenic Cavendish bananas with resistance to Fusarium wilt tropical race 4” was published in Nature Communications, in November 2017. It presents the work and conclusions from their study and lays out a plan for further research. I’d recommend reading the Introduction and Results sections, skimming the technical material and Methods sections. It focuses pretty heavily on the genetics involved. This is a short article discussing Dale’s groups successful genetic work on Cavendish bananas from Seed World last year. “World’s First Panama Disease Resistent Cavendish Bananas”. This piece is certainly timely for us, as we recently sampled our Vietnamese neighbor’s delicious bananas here in So. Calif/Long Beach. My built-in bias to home-grown bananas as tasteless was overturned by his bananas — smaller, plumper, wonderful flavor. Unfortunately, there’s a language barrier to discovering more about these bananas. Really good reading, thank you! Thanks for sharing. Fusarium wilt is difficult to deal with on a number of crops.